Southern Indiana may not sound glamorous, but Bloomington is special place. It’s a college town, and very near the hippy-dippy-country-town of Nashville. Our population just about doubles when the students arrive in August, but they bring an influx of culture and excitement. Some of my friends call Bloomington “the town of requirement” : if you want it or need it, Bloomington probably has it. Limestone carving lessons? Check. Tibetan monastery? Check. Nudist communes? Check. We’ve got it all. 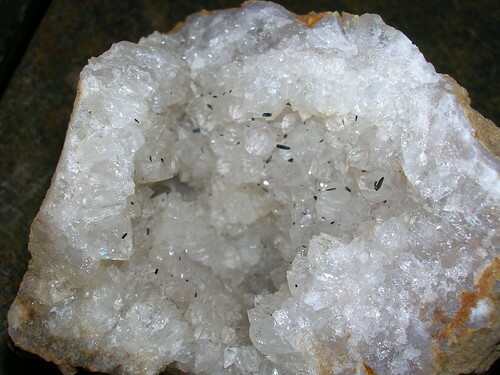 Naturally occurring geodes! I picked this up out of a creek bed yesterday — exactly like this. It’s nice to know there are little pieces of beauty around every corner, just waiting to be discovered. Excellent find. We don’t get a lot of those over in our neck of the woods, but I have picked up a lot of other cool rocks. Whatever the find, it truly is a treasure.